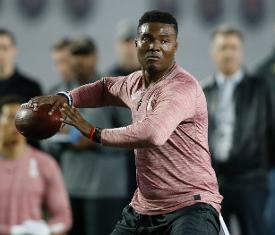 Haskins, one of the top quarterback prospects available in this month's draft, has already worked out for the Oakland Raiders and visited with the Denver Broncos and Washington Redskins, with the two visits coming this week. They brought Oklahoma quarterback Kyler Murray to their facility for a visit on Thursday, and they've also visited with Missouri's Drew Lock, Duke's Daniel Jones and West Virginia's Will Grier. "It would be a dream come true as far as being able to go back home where my family is and play for that franchise," Haskins said at the NFL Scouting Combine of the possibility of being drafted by the Giants.